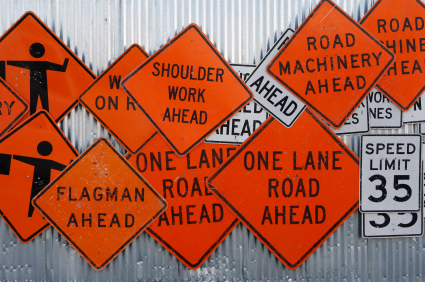 Construction signs are essential tools in to directing the flow of traffic, warning others of potential hazards and ensuring the safety of workers. On any construction site there are many pitfalls and dangers. Whether you need signs that prohibit unauthorized access or warn workers about potentially hazardous areas, you need clear, eye-catching signs to warn others and ensure the proper steps are taken to ensure safety. Our safety signs use colors that will grab attention and use concise language that will alert both workers and visitors alike of potential hazards and how to approach areas—if at all. Some areas require special attention due to construction, others just because they are inherently hazardous environments. In these cases, personal protection must be worn, be it goggles, ear protection, hard hats, etc. Ensure that you are OSHA compliant with personal protective equipment signs. We have all ranges of personal protective equipment notifications and can even create custom signs for your specific needs. Signs are subject to temperature extremes and inclement weather. At Zimmerman Paint, all of our construction signs and road construction signs are manufactured in-house using durable, 3m vinyl and guaranteed to last against the ravages of the outdoors. The Federal Highway Administration has strict specifications that must be followed on road construction signs. New and revised design specifications are updated quarterly. We use special software that ensures our construction signs meet the most up to date Federal Highway Administration and the Manual on Uniform Traffic Control Devices specifications for design, size and color. Contact us today if you have any questions about our signage services or wish to place an order. (419) 332-7009.